Blaum, Niels, Fleissner, Gunther, Jeltsch, Florian, and Rossmanth, Eva. 2007. The conflicting importance of shrubby landscape structures for the reproductive success of the yellow mongoose (cynictis penicillata). Journal of Mammaology Accessed 20 March 2009. Cruaud, A., Li, B., Perez, M., Tillier, A., and Veron G. Systematic relationships of the bushy-tailed and blacked-footed mongooses(genus Bdeogale, Herpestidae, Carnivora) based on molecular, chromosomal and morphological evidence. Journal of Zoological Systematics & Evolutionary Research. Accessed 20 March 2009. Green Kalahari Accommodation 2006. http://www.greenkalahari.com/augrabies.html Accessed April 3 2009. Khamsi, Roxanne. 2007. Mongoose pups make noisy work of sibling unity. New Scientist. Accessed 20 March 2009. Leifert, Harvey. 2008. Pushy pups, passive “parents”. Natural History. Accessed 20 March 2009. Light, J. 1999. "Cynictis penicillata", Animal Diversity Web. http://animaldiversity.ummz.umich.edu/site/accounts/information/Cynictis_penicillata.html Accessed April 3 2009. Manser, Marta and Muller, Corsin. 2008. Scent-marking and intrasexual competition in a cooperative carnivore with low reproductive skew. Ethology. Accesssed 20 March 2009. NaturePhoto-CZ. 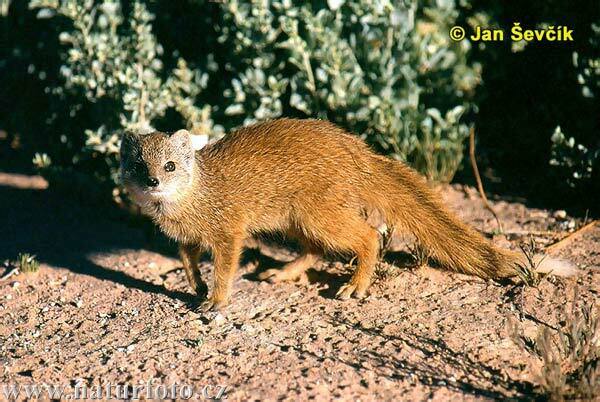 <URL: http://www.naturephoto-cz.com/yellow-mongoose:cynictis-penicillata-photo-1355.html>. Accessed 3 April 2009. PredatorConservationTrust.http://www.predatorconservation.com/yellow_mongoose.htm Accessed April 3 2009. Roux le, Aliza 2007. Communication in the yellow mongoose, Cynictis pencillata. <URL: http://etd.sun.ac.za/jspui/handle/10019/666. Accessed April 3 2009. TheAnimalFiles2006.http://www.theanimalfiles.com/mammals/carnivores/mongoose_yellow.html Accessed April 3 2009. Yellow Mongoose 2004. <URL: http://itech.pjc.edu/sctag/Yellow_Mongoose/Yellow%20Mongoose.htm Accessed 3 April 2009. Yellow Mongoose (Cynictis penicillata) 2008. http://www.lioncrusher.com/animal.asp?animal=126 Accessed April 3 2009.